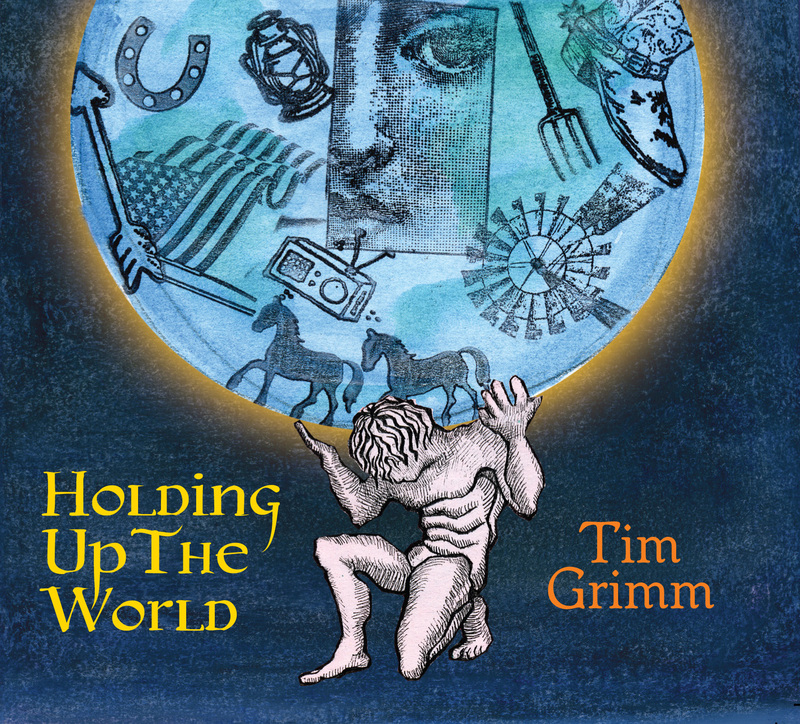 A Stranger In This Time ranges from Tim Grimm’s signature reverence for the people and the land where he grew up to sharply crafted and damning indictments of the times in which we live; from deep, poetic ballads of bittersweet love to edgy, groove-driven social commentary. The opening track, “These Rollin’ Hills” invites us in with love of Grimm’s home ground and a subtle foreboding about the upcoming winter, both actual and metaphorical. The songs “Gonna Be Great” and “Black Snake” give a nod to both Leonard Cohen and Bob Dylan in their gritty production and social-political protest vibe; both full of stunning guitar riffs, electric and acoustic, as well as compelling bass and drum beats. There are songs of lush soundscape and potent images with the mesmerizing urgency of “Over The Waves”, and “Finding Home” which evokes deep yearning. “Thirteen Years” is pure, classic Tim Grimm; a song about the tree that fell on his grandfather’s farm and that many years later became the wood for the guitar on which he recorded the cd. Tim was supported both in the writing and production of the songs by his sons Jackson Grimm (guitars, banjo, octave mandolin, vocals) and Connor Grimm (bass), as well as his wife, Jan Lucas (harmonica, vocals) and it was a truly collaborative effort. Both sons have played and toured with Tim on and off for a few years, and his wife Jan has been touring with him since 2004, but this is the first time they have collaborated as writers, musicians, and producers in such a focused way. The result honors the folk tradition from which Tim comes, and pushes the boundaries of that tradition with drums and percussion by guest Hannah Linn. Diederik van Wassenaer is the guest fiddler on two tracks, bringing a heady energy to “So Strong” and an old-time feel to the traditional song “Darling Cory” which was arranged by Jackson Grimm. The cd was recorded in the rolling hills of Monroe County, Indiana at Airtime Studios under the watchful eye and ear of long-time collaborator Dave Weber. Tim Grimm, singer-songwriter and actor, has toured and recorded with his friend, Ramblin’ Jack Elliott, appeared with Harrison Ford in the film Clear and Present Danger, and has shared the stage with writer and poet Wendell Berry. His recent recording, The Turning Point, produced the #1 song on Folk radio in 2014: “King of the Folksingers” (a tribute to his friend and musical icon, Ramblin’ Jack). Grimm released the single only “Woody’s Landlord” in October, 2016– the song tracks Woody Guthrie’s relationship with Donald Trump, Tim’s strange connection with Mike Pence (high school), and the hope for a better world. “Woody’s Landlord” was the #1 song on Folk Radio in 2016 and was written before the election. On the new cd, the song “Gonna Be Great” was written post-election and has none of the whimsy that the first song has; it is deep and dark and there’s no escaping Grimm’s intent. Grimm lives with his wife on 80 acres in southern Indiana, and has been called “The Poet Laureate of the rural Midwest.” Grimm’s song “The Lake” was in the soundtrack for A Walk In The Woods, starring Robert Redford, and the director, Ken Kwapis, calls Grimm “Indiana’s Renaissance man”. As an actor, he has appeared in numerous feature films and for 2 years co-starred in NBC’s “Reasonable Doubts”. Tim Grimm is also the man behind the successful theater program and concept cd ‘WILDERNESS PLOTS’ that besides Tim features several of the USA Midwest’s finest songwriters— Krista Detor, Carrie Newcomer, Tom Roznowski, and Michael White. 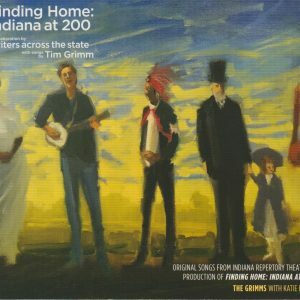 Both TV specials about this show -the documentary on the story and song and the second, a full Wilderness Plots In Concert, were nominated for Emmy AwardsTim Grimm also wrote all music for and performed in ‘Finding Home – Indiana at 200’ , the 2016 theatre show that celebrated the state of Indiana’s bicentennial. Tim’s story-driven songs have made him popular in Europe— where he spends 2-3 months touring each year. A Stranger in This Time is being simultaneously released on the American label Vault Records, the Dutch label Cavalier Recordings and the Italian label Appaloosa. 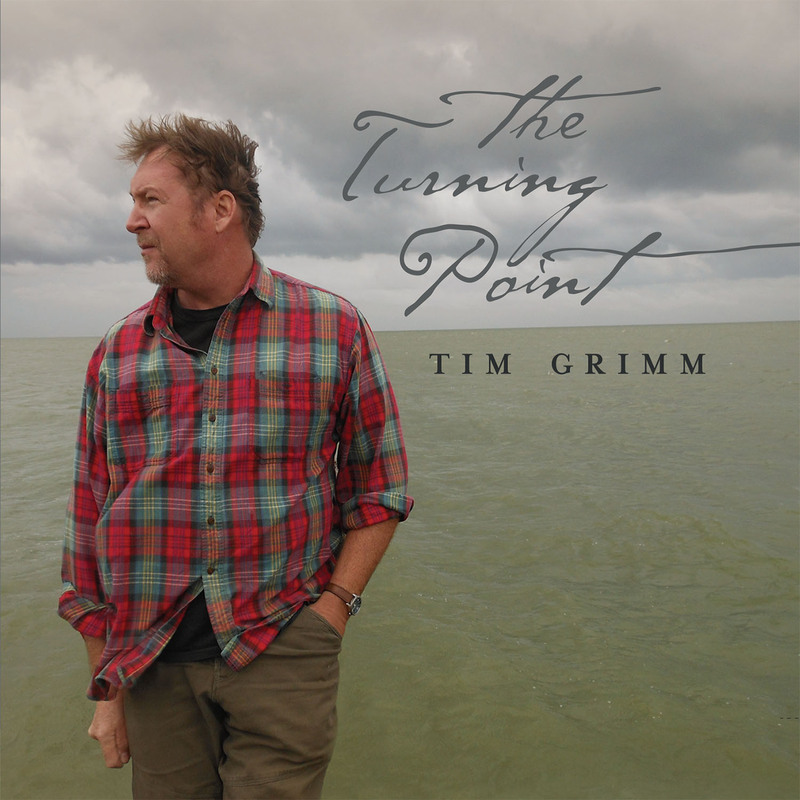 You can order all Tim Grimm CD’s from our online shop.